Support this virtual Wholecaust Museum and build the physical Wholecaust Museums that will document the worst atrocities in history. This amazing google search for “socialist crimes against humanity” reveals only 45 results on the web, and 30 results on newsgroups. And almost all of them are actually the phrase “national socialist crimes against humanity.” Almost none of the results is the phrase “socialist crimes against humanity” without the word “national” preceding it (as for “national socialist crimes against humanity”). Http://rexcurry.net is one of the first websites to use the phrase “socialist crimes against humanity” without preceding it with the word “national” and is the first website to point out this remarkable bias in the media and the general population as evidenced by web searches. A websearch for “socialist holocaust” reveals only 28 hits on the web, 44 on newsgroups. That is hard to believe. 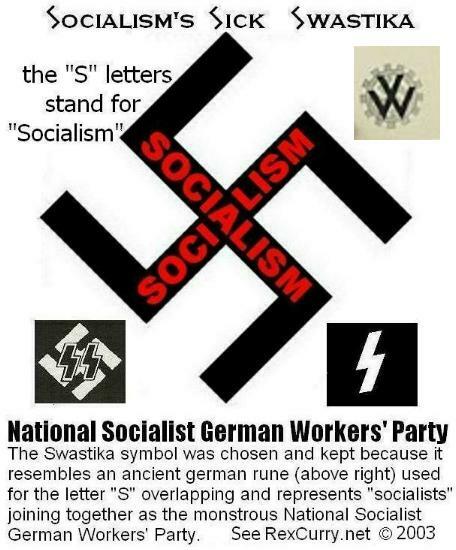 And some of those are actually preceded by the word “national” for the actual phrase “national socialist holocaust” -another evasion of the much larger holocaust of the former Union of Soviet Socialist Republics, and the People’s Republic of China. In comparison, a web search for “nazi holocaust” reveals over 27,000 hits on the web, over 14,000 on newsgroups. Http://rexcurry.net is one of the first websites to use the phrase “socialist holocaust” without preceding it with the word “national” and is the first website to point out this remarkable bias in the media and the general population as evidenced by web searches. Row erupts over Auschwitz exhibit April 6, 2007 This was corrected from a dishonest Reuters news story. WARSAW - A dispute has broken out between Poland and Russia over a memorial at the Auschwitz death camp to citizens of the Union of Soviet Socialist Republics who were victims of World War II and the Nazi Holocaust under the National Socialist German Workers’ Party. It is rekindling old resentments between the two countries, Poland and Russia. An exhibition at the camp museum is dedicated to citizens of the Union of Soviet Socialist Republics who died in the war with Germany under the National Socialist German Workers Party. The exhibition has been closed for three years and its opening has been delayed by a disagreement over the nationalities of the victims, officials said. Russian historians say almost half the 6 million Jews who died in the Holocaust were citizens of the former Union of Soviet Socialist Republics. But the Auschwitz museum disputes this, saying almost 1 million of these Jews were citizens of Poland, Romania and the Baltics, who were only in the Union of Soviet Socialist Republics as a result of a deal in 1939 between Hitler (head of Germany under the National Socialist German Workers’ Party) and Stalin (head of the Union of Soviet Socialist Republics) to annex central Europe. In 1939, Socialists in Germany and the USSR joined as allies to invade Poland in a pact (the Molotov-Ribbentrop Pact) to divide up Europe, spreading WWII. It led to the socialist Wholecost. Holocaust Museums will quadruple in size under plans to add Wholecaust Museums. New Wholecaust Museums are slated for six cities worldwide. 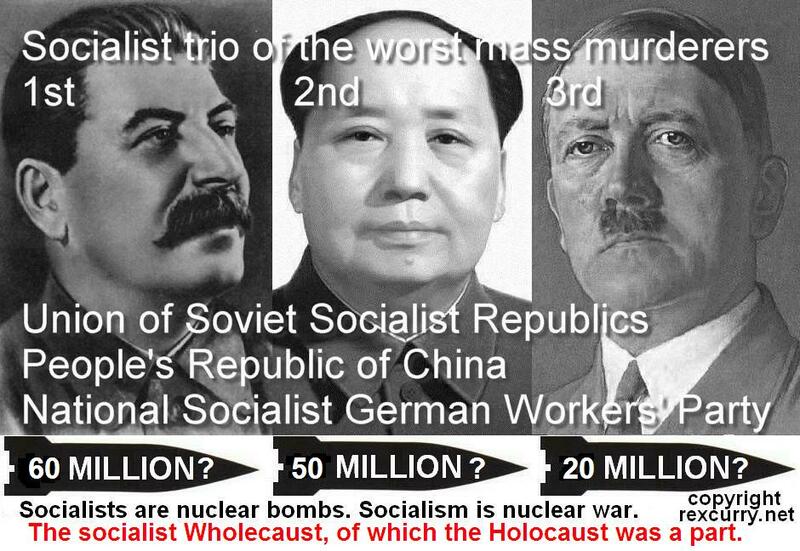 The museums will document the Wholecaust (of which the Holocaust was a part): 62 million killed under the former Union of Soviet Socialist Republics; 35 million under the Peoples' Republic of China; 21 million under the National Socialist German Workers' Party. http://rexcurry.net/socialists.html (Most scholars agree that Hitler's death toll was exceeded by Stalin and Mao independently. The death tolls cited are from the book "Death by Government" by Professor R. J. Rummel). They were the worst atrocities in human history. All older Holocaust museums are part of the new Wholecaust Museum network. New Wholecaust Museums are slated for New York City, DC, Los Angeles, Berlin, Moscow and Beijing. Older Holocaust Museums did a great job fighting ignorance concerning one-fourth of the Wholecaust. The wider museums will finish the work that the older museums began. The National Socialist German Workers' Party and the Union of Soviet Socialist Republics invaded Poland in 1939 as allies in a pact to divide up Europe. Before, during and after the National Socialist German Workers' Party, the Union of Soviet Socialist Republics killed even more people. The Peoples' Republic of China followed. Those misanthropes and necrophiliacs set the worst records that have never been broken. Fight the Wholecaust deniers. The world must never forget. Francis Bellamy should be added to Holocaust Museums as the origin of the straight-arm salute, and both Francis and Edward Bellamy should be added as sources for the dogma of "National Socialism." At the height of Nazi power, the USA's government deliberately stepped onto the same path with national numbering imposed in 1935 with the social security system. The federal government was growing massively and attempting to nationalize the economy in many ways. The US Supreme Court struck down much of the new legislation as unconstitutional until justices were pressured by the "switch in time that socialized nine." Government was taking over education in the USA and imposing segregation by law and teaching racism as official policy. Laws required daily robotic chanting of the pledge upon the ring of a government bell, like Pavlov's lapdogs of the state. The whole cost of socialism's caustic ruin can not be calculated. Wholecaust Museums help expose the misery and loss of life. Wholecaust Centers would fight hate and promote tolerance. Plans have been unveiled to establish Wholecaust research centers. The director of the project is historian Dr. Rex Curry. The project will continue the great work of Simon Wiesenthal who died in 2005 in Vienna at the age of 96. Professor Curry said that the continuing search for Nazis is motivated not by revenge, but rather justice for the hundreds of millions of people who suffered and died in the three Holocausts that make up the large socialist Wholecaust, the worst loss of humanity in history. Dr. Curry's efforts led to amazing discoveries about the history of the dogma that led to the slaughters. Dr. Curry's extensive archives are to be part of the new centers. In addition to research, the institute will also sponsor readings, lectures and exhibitions. The Institute would work to counteract socialism and anti-capitalism. This would be following in the spirit of those who spoke out against the Union of Soviet Socialist Republics, the National Socialist German Workers' Party, and the Peoples' Republic of China.